Add the blanched almonds to a bowl, cover with water, and let sit for approx. 6 hrs. Drain the almonds and add them to a blender. Add agave syrup and water. Blend until completely smooth. 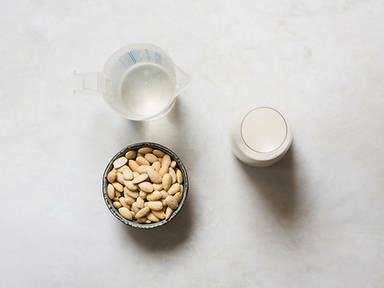 Strain the almond milk through a sieve into a large measuring cup and press the pulp with a cooking spoon to extract more milk. Enjoy the fresh homemade almond milk in your smoothie or all by itself!